Pricing & Gift Certificates. Spiritual Healer. Psychic Medium, Clairvoyant, Reiki. Gold Coast, Australia. I am so confident that you will be 100% satisfied with any of my services that there will be no charge if your expectations are not met during one of my readings. If you have paid in advance then you will be refunded in full. 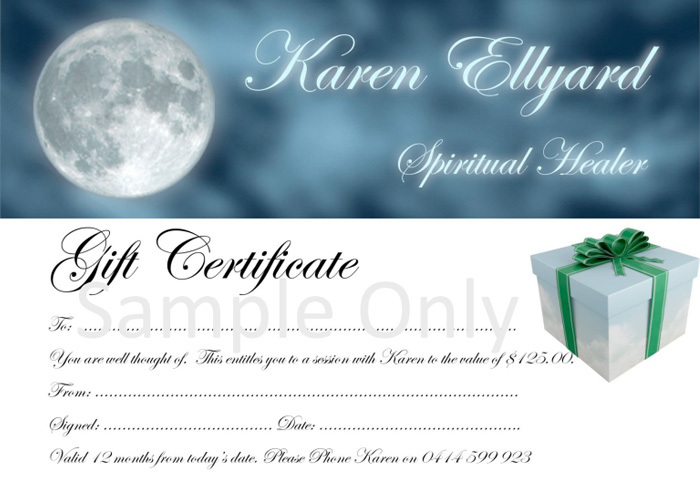 A Psychic Reading session runs for 60 minutes and are $120 per session. There is a 60 minute minimum and then $20 per 15 minutes thereafter. Sessions are by appointment only. If you wish to bring a recording device to record your session you are most welcome. These sessions usually incorporate a combination of services and run for 90 minutes and are $160 per session. There is a 90 minute minimum and then $20 per 15 minutes thereafter. Sessions are by appointment only. A session may include a reading and a combination of any of the services I offer and will be tailored as required. Your requirements will be discussed when making an appointment so I can best assess your needs. If you wish to bring a recording device to record your session you are most welcome. These sessions run for 60 minutes and are $120 per session. There is a 60 minute minimum and then $20 per 15 minutes thereafter. Sessions are by appointment only. Each session will be tailored as required. Your requirements will be discussed when making an appointment so I can best assess your needs. These sessions run for 60 minutes and are $120 per session. There is a 60 minute minimum and then $20 per 15 minutes thereafter. Sessions are by appointment only. A session may include a combination of any of the services I offer (including distant Reiki healing) and will be tailored as required. Your requirements will be discussed when making an appointment so I can best assess your needs. I am so confident that you will be satisfied with my services that I am prepared to offer you your money back if your expectations are not met during one of our readings. When depositing please put your name in the details.